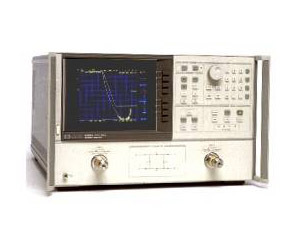 The Agilent 8720C vector network analyzer characterizes RF and microwave components down to 50 MHz and up to 20 GHz. This analyzer includes a fast-sweeping synthesized source, S-parameter test set, tuned receiver, and large color display in a single package. The Agilent 8720C is an ideal choice for cost- and space-conscious engineers in research and development, manufacturing, incoming inspection, or quality assurance.